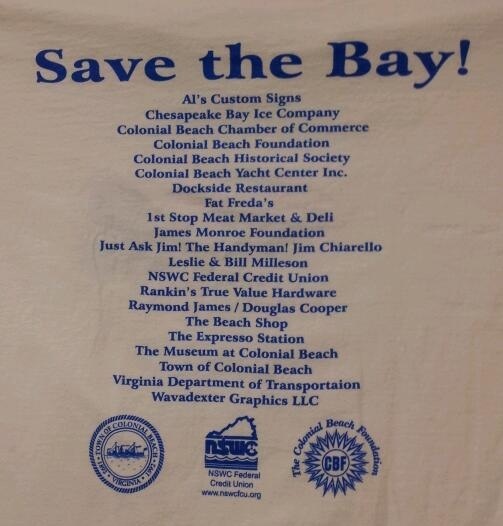 There's a Save The Bay Cleanup Day in support of the Chesapeake Bay Foundation's annual event to rid areas upstream of trash and other debris that could runoff into the waterways. The previous event was organized by the Museum at Colonial Beach's Historical Society and the Colonial Beach Yacht Club. It took place on Saturday, June 2nd, 2012 and there was a great turnout of volunteers to help. 2013's event was Saturday, June 1st. Kayak expeditions beforehand pinpoint areas of concern in and around Monroe Bay in Colonial Beach. To take advantage of low tides, the cleanup event takes place at two different points during the day. The first "shift" is from 7:30am to 1:00pm and the second session takes place from 1:00pm to 7:00pm. Volunteers are needed for both time slots and will be assigned to different locations anywhere from the downtown area to the river and the bay. Volunteers are scheduled to receive a cool t-shirt like the one pictured above. The front of the shirt has the event logo/emblem. Of course, you don't have to give a whole day, just a half a day will help. Please consider volunteering for this great event and make a difference in the overall health of our local waterways. The staging area is near Dockside Restaurant. The event is sponsored in part by the Colonial Beach Foundation, the Colonial Beach Chamber of Commerce and the NSWC Federal Credit Union in Dahlgren.